Wendy Briggs, RDH, addresses the oral-systemic link and the impact it has in your practice and the lives of your patients. Our dental services are not only providing a cleaning— it is saving lives. Listen in to Wendy discuss the prevelance of periodontal infections, the rocking-our-world science and how to present this to your patients so that we can give them the clarity they need to make the right decision concerning their oral and overall health. 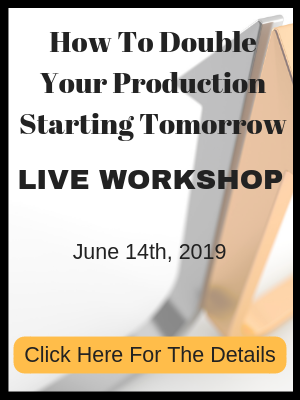 [music] Welcome to the Double Your Production podcast with the Team Training Institute. 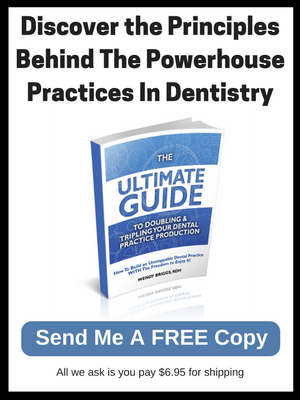 The one place designed for dentists and their staff who want to grow their practices by following in the footsteps of those that have done it or in the trenches who know exactly what you’re going through. And now your leaders, the stars of the podcast, Dr. John Meis and Wendy Briggs. [music] Hey, everybody. 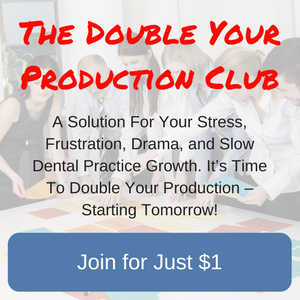 This is Wendy Briggs with a Double Your Production podcast. Today, we are going to listen in to a lecture that Dr. John and I just finished. A 21 city tour for a very large organization. And we presented information on how we can accelerate practice growth through hygiene. So today we thought for the podcast we’d release a few highlights from this tour. And here’s one where I’m discussing the prevalence of periodontal disease. And then we’ll have a second part, another follow up podcast, coming soon where I walk you through five steps to increase periodontal case acceptance. So this two-part series where we’re listening in on the role of periodontal disease therapy in your practices today. Hopefully, we’ll give you some insights on how we can maximize hygiene productivity while providing a better level of service– a high level of service, as we’re maximizing our role as a periodontal therapist. I hope you enjoy. Periodontal disease is an oral manifestation with systemic condition. We know that. So let’s do a quick science touch up. Let’s do a quick review of the latest science and the studies that are showing us that periodontal disease and treatment of that is about more than saving teeth. It really is about saving lives. Let’s talk through some of the science. We know patients may be thinking, “Well, what’s the big deal, right? It’s just a cleaning.” But we all know it’s so much more than that. And poor old hygiene is just one of the risk factors that can contribute to the decline of the patient’s oral health, right? We also have smoking. And we’ve already talked a little bit about age, how age can be a tremendous factor. One could say that periodontal disease is a natural part of the aging process. As we age, it’s not uncommon to see a decline in periodontal health, okay? We know gender also plays a role in this scenario. So there’s a lot of risk factors happening when it comes to periodontal disease. And I think it’s important that we know the facts about where we are as a profession and as an industry, and that our patients also have clarity on the severity of these risk factors and what it can mean to their overall systemic health. So we don’t have time to do a huge dive and go over all the latest science. But I want to share with you a few studies that I found compelling. Because initially when we see bleeding gums, years ago we might have thought, “Well, gosh. This patient needs the flossing lecture or they need OHI. We’ve got to teach them the best toothbrushing technique. That toothbrush has got to be angled at that 45-degree angle so that they get maximum impact.” And it’s not that those things aren’t true. But we also know now that bleeding gums can be a key early warning sign for more than 20 serious medical disorders. It’s not just about poor hygiene that’s driving that. It could be indicative of a serious systemic issue that the patient needs our help with, okay? So bleeding gums [is?] the first clinical warning sign for leukemia. This is really important. 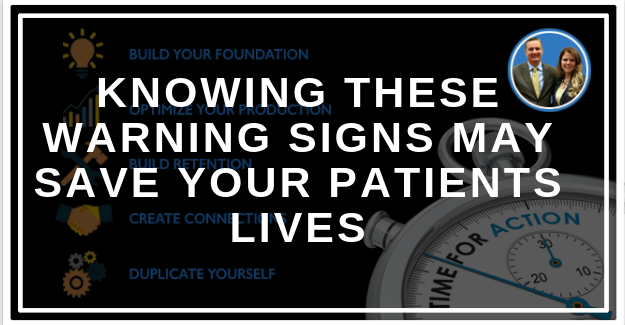 It’s important for patients to understand where we are. And more than ever before we have the science, right? That supports the link between periodontal disease and systemic health. So we now have the research and the knowledge needed to address the underlying medical issues that can cause poor oral health, okay? And one can cause the other. And sometimes we see that it’s this vicious cycle, okay? So let’s dive into some very compelling studies. This video. This short video is produced by AAOSH, the American Academy of Oral Systemic Health. And in this video, Dr. Dan Sindelar talks about a study that was published by the American Medical Association. Okay, I’m not going to play the whole thing for you, but I’m going to play what I think is the most compelling important part of this study that was recently published. That’s pretty compelling, right? It appears that the half of all heart attack incidents in the United States are triggered by oral pathogens. Wow, okay. So here’s the highlights of that study there for you, it’s really fascinating. We’ve long known, or suspected, a link between heart disease and periodontal disease, and now we actually have DNA [inaudible] technology used with research to identify yes, the bacteria that are found in the blood clots of those who suffered a heart attack or a stroke, actually did originate in the mouth. That’s what’s happening with these patients. And it’s more than heart disease that’s concerning. Interestingly enough, there’s a lot more links coming out in recent years about the bacteria that cause periodontal disease and cancer. A variety of different kinds of cancers Here’s a study that was published in the [Selfhost?] and Micro Journal in 2013 talking about how Fusobacterium nucleatum promotes colorectal carcinogenesis. So what happens is the VISA bacteria have found a way to enter the bloodstream, we’ll talk more about that in a minute, and they will actually turn on cancer growth genes and stimulate negative immune responses. And when that occurs the colorectal tumors are formed. So lead researcher on this study was Dr.Yiping Han from Case Western Reserve University and she basically said as a summary, “We need to work effectively reducing Fusobacterium load in the colon and the mouth. Interestingly enough, Fusobacterium nucleatum was also the bacterium that was linked to the first ever documented case of a stillborn baby called septic infection of the unborn child because the mother had had an upper respiratory tract infection a few weeks prior, and it was determined that this bacterium was what caused the death of the fetus. So Fusobacterium nucleatum is a very common bacteria associated with periodontal disease but it’s a bad bug. These are some serious bacteria that we’re dealing with here. And it’s important that we understand how serious it can be. Now there’s more and more studies coming out. This was published in August of 2017. Gum disease, an increased link to many cancers. Not just colon and rectal tumors, not just one specific cancer. But this study was a large prospective cohort study showed postmenopausal women, interestingly enough, with a history of periodontal disease including those who had never smoked, are at significantly increased overall risk for cancer, as well as site-specific cancers. Lung, breast, esophageal, gallbladder, and melanoma even, increased risk, if they have a history of periodontal disease. So that’s stunning to me that we’re learning so much more about what’s actually happening. And you can read the details of this study if you like, but the association between periodontal disease and site-specific cancers was observed in multiple different areas. Okay, so fascinating stuff. Another study that was published is that gum disease may increase lung cancer risk. And this is a study that was published in the Journal of Periodontology in 2016, and it found that people with periodontal disease have a 1.24 fold increased risk of developing lung cancer. Interestingly enough in this study, the data also suggested that women with periodontal disease are more likely than males to develop lung cancer. So post-menopausal women with a history of periodontal disease are at risk for a lot of really potentially serious health threats. It’s important that we pay attention to that. And here’s another one that was published, severe gum disease was linked to 24% higher risk of cancer. This was published by Tufts University. And again, fascinating stuff about how critical it is that we address the periodontal disease concerns. One of the most common things that we hear from patients is, “Oh, I don’t have the money for all that. I just want the regular cleaning. I just want the free cleaning.” And I find, this study was fascinating to me, because this one showed that treating gum disease means lower annual medical costs. Treating gum disease reduces hospital admissions, especially on people that had had a history of other health challenges. People with a history of diabetes, stroke, heart disease, and pregnancy, all experienced dramatically lower annual medical costs. Over $5,600, for people with a history of stroke. I mean, that’s significant. Same thing with hospital admissions. People that had a history of stroke, it reduced their hospital admissions by 21%, heart disease, 28%, diabetes, more than 39%. This is really compelling information that I think helps us build value and create urgency for patients who have a periodontal need. Just as we’ve talked about before, creating urgency and building value helps patients accept all different kinds of care. [inaudible] care, but also periodontal care, and it’s important for us to understand that we have a responsibility in helping build value and create urgency for these services, that our patients desperately need. And in some instances, even though it can be frustrating to deal with the patient that says, “Oh, I don’t need all that. Just give me the regular cleaning. Just give me the free cleaning.” They don’t know what they don’t know. And we have a responsibility to help them see why we’re having these conversations. So again, we’ve got an interesting challenge here. And we know more about what’s happening with the disease. We know that chronic periodontal infections have been classified as a biofilm disease, and free-floating your planktonic bacteria is very different than bacteria that have succeeded in forming a biofilm. When bacteria succeed in forming a biofilm in the human host, the infection often becomes untreatable, and that’s when it develops into a chronic state. So we see biofilm diseases causing problems in our population by way of chronic ear infections. We all probably have known of a young one that got ear infection after ear infection after ear infection, when they were little, and the first few infections, the antibiotics helped them work through it just fine, but after a time the antibiotics aren’t helping anymore. That’s when we know the bacteria has succeeded in creating a biofilm, and it becomes a biofilm disease, and it becomes a chronic state. So then, more invasive treatment is required. So we see this with cystic fibrosis and diabetics. Biofilm diseases are important for us to pay attention to, because they affect millions of people every year. They cause many deaths. I believe the latest statistic I saw was 500,000 people a year actually die from biofilm infections. So this is important for us to keep in mind, because once inside the biofilm, the cells become more resistant to the body’s natural defence mechanism. They’re resistant to antibiotics. It’s actually 1,000 times more resistant to antibiotics. And we’ve seen overuse of antibiotics and antimicrobials contributing to the development of super bacteria. So this is really interesting. As much research as we have, proving significant health risks– health threats for patients who have periodontal disease. We also have research showing us that gold standard anti-microbial that many of us have used for decades are no longer as effective as they once were. So this creates chaos in the marketplace in some instances because we have this science that’s showing us it’s time to think differently about these challenges. Okay? It’s time to think differently about where we are. And here’s one of the most compelling things that we’ve learned in recent years. It’s that scaling and root planting alone is not enough. Scaling and root planting alone is not enough especially if we’re dealing with biophome infections. Did you know that bacterial levels return to pre-treatment levels 21 to 60 days after we’ve completed scaling and root planting. If all we’re doing is scaling and root planting, 21 to 60 days later, this is what we’ve got. If all we’re doing is scaling and root planting, it’s like mowing and infested lawn and expecting things to improve. We can mow the lawn that’s weed-ridden. Is it going to look better for a couple of days, maybe a couple of weeks? Yes. But unless we address the source of the infestation, where are we going to be 60 days from now? Right back where we started, right? So that’s why we’re seeing strategies evolving to focus on reducing the bacteria load in the mouth and the rest of the body. We’ve got to look beyond our traditional methods that, for many of us– when I went to hygiene school, that’s what we were taught. It was always scaling and root planting. Okay? So we are seeing multi-faceted approach emerge. We’re seeing scaling and root planting plus additional adjunctive procedures. Scaling and root planting plus laser treatments. Scaling and root planting plus laser treatments and locally delivered antibiotics. There’s a reason for that, right? Because when we have a patient that has a periodontal infection, certainly we have the deposit, the calculus that needs to be removed, right? But we also need to address the bacterial infestation which is where the lasers come in. And we need to treat the infection which is where the Arestin comes in. Okay? So it’s not enough just to remove the calculus. We also need to reduce the bacterial load and treat the infection. Which is why a multi-faceted approach is so powerful. Okay? So as we go through this, one of the other challenges I find really compelling is that for many of us, we know how important it is that patients get this periodontal therapy. We talk with the patient. We identify. We tell them exactly what they need. But our challenge often comes in patient acceptance. We can talk about scaling and root planting all day long, but we may not have everybody moving forward. Okay? So we’re going to talk through five steps that can help us improve case acceptance for periodontal procedures. And I want to begin that conversation by really simplifying what we’re trying to accomplish. When it comes to patient conversion, we’re sticking a change of attitude, emotion, or a viewpoint from one of indifference, disbelief, or antagonism to one of acceptance. So let’s talk and break that down for a minute. When we’re talking about periodontal disease, do we ever deal with patients who are indifferent? Yeah. We deal with that all the time, don’t we? Because you could have the patient coming through the door, class four, mobility everywhere. In fact, if they sneeze just so, we’re worried. And what are they wanting? What do they ask us for? Whitening. Every time. Right? Every time. They want their teeth whitened. They are completely indifferent to the fact that their disease is advanced because they don’t know what they don’t know. Right? Do we ever have patients that don’t believe us, that are in disbelief that they need to have anything done. Sure we do because I don’t know about you, we see a fair number of patients that come through our doors for a second opinion because someone’s told them something and they don’t believe it. That trust bucket is not full so they’re seeking an outside opinion. Do we ever have patients that are antagonistic about the care they need? Yes, we do. An intuitive BA can spot those ones coming from a mile away because they call the office and say, “I need to schedule an appointment for a regular cleaning [laughter].” Right? Which reason might suggest that they are adamant about a regular cleaning because they’ve been told someplace else that they need more than that. Okay? So we deal with these situations all the time when it comes to discussing periodontal therapy. What we want to dive into is how we can move the patient and inspire change of attitude, emotion, or viewpoint more consistently. Okay? How can we overcome some of these challenges on a more consistent basis and help patients understand why they need the care that they need so that we can help minimize future problems for them. Okay? That’s what we’re going to be talking about here as we go. And we know that there’s conflict created when we don’t have alignment here, which is why it’s so powerful to have the hygienist and the dentist together working on this partnership. This was something that was written on the whiteboard in the staff lounge. It says, “The patient doesn’t want quads? Fine. [Write them?] the chart, explain, then give them their free cleaning. Better than a hygienist doing nothing and the patient not coming back.” Can you kind of feel the frustration in this sentence? So can you tell this has been a point of conflict with this team? So the key here is we’ve got to be aligned. We’ve got to be on the same page. And we also should know what steps the other is using to shift the patient, their emotion or viewpoint, to one of acceptance. Okay? So let’s dive in and talk about that for a minute. The same case acceptance principles that we’ve discussed already do apply. We’ve got to build value and it’s super important we talk about [perio?] that we simplify our conversations. Very important that we keep things simple because the patients need to be able to understand us. And it’s also just as important that we understand the patient. We’ve got to understand the patient as well. So I want to share with you some information that was shared with me by Aura Pharma. So just so you know, I’m actually on Aura Pharma’s speakers’ bureau. And I’m excited to share some of this information with you about Aura Pharma, and one of the most compelling things that I wanted to share is the research that they had done to help us better understand our patient. Interestingly enough, when we look at what patients’ expectations are for their appointments, we can probably list off several of these things. Patients may be coming in for their free cleaning, which means they’re expecting to have minimal out-of-pocket expense, minimal time structure. Doesn’t hurt, right? So nothing must be wrong. Patients may feel like if they’re coming in for this regular cleaning or their free cleaning, and they end up needing more than that, they maybe have a feeling that they’re being sold unnecessary care. And I think it’s important for us to understand that when we’re talking about periodontal therapy, there is no need to discuss unnecessary care with anyone. There are so many patients that have a need for this that is an actual need. Okay? Sometimes, though, especially patients in my experience that come in with new patient offer of some kind. Like a $59 offer. And then all of a sudden you have all this other stuff. Don’t they feel like they’re being sold? They view that as kind of like a bait and switch type strategy. So that’s why these five steps are so important, okay? Patients have objections that we have to work to overcome. And sometimes patients are concerned with the cost. How are they going to be able to afford treatment? So understanding our patients helps us move them better towards conversion, okay? So what’s the cause of the concerns? What I love about this information is that OraPharma has done some compelling research about what motivates and inspires patients to move forward with care or why they didn’t? So this was an online survey conducted for several years to understand patient perceptions in periodontal disease management. And each year about 300 patients that were diagnosed with periodontal disease participated in a study. And all patients have had a scaling and root planing procedure. The focus of this was to figure out how well we communicate with patients about what they need? How well are we communicating with them? How well are we educating them about their periodontal disease? So I found these results to be fascinating. So here’s a few lessons for us to learn here. The more urgent the message was the more likely they are to move forward with the care. So more patients chose to be treated when they felt the message was delivered in a more urgent manner. 63% chose to receive treatment when they felt the message was most urgent or extremely urgent. Whereas, 49% chose to forgo treatment if it was fairly urgent or mildly urgent. This shows that the perception of urgency results in higher rate of case acceptance. Here’s also one thing that I’ve seen from hours of watching hygienists talk to patients about perio. We for some reason have a need to use diminishing language. And we feel more comfortable with a mildly urgent or fairly urgent message rather than an extremely urgent or most urgent message, okay? So I’ve actually heard hygienists say, ” Well, here’s what I see. The dilemma is.” And before she even finishes the sentence she says, “But it’s not a huge dilemma.” Like we’re trying to minimize the patient freak out, okay? The reality is we’ve got to use strong language. We’ve got to use urgent language. It’s important creating urgency when it comes to perios just like creating urgency with any other dental disease, okay? So that’s something that I found really interesting. Another thing that was interesting is that patients who were informed moved forward. They found that being informed enhances patient acceptance. So 81% of those who were informed with their pocket depths were treated for periodontal disease. While only 35% were treated if they were not informed. Interesting, right? So understanding the role of infection was also important. How strongly do you believe that infection is the key component of periodontal disease? 64% of patients who have been treated believed infection was the key component while only 36% of those who have not been treated believed it. So understanding the role of infection is also key to patients moving forward. Interesting, okay? Another interesting question they were asked is how likely would you be to go to the dentist immediately if you knew you had an active infection in your mouth? More than three, four of the patients would be likely to go to the dentist immediately if they knew they had an active infection in their mouth. So does this give us some opportunities here to really dive into how we’re discussing periodontal therapy? We know using the word infection is important. We know that informing the patient of their pocket depths is also important. And I’m actually going to teach some very specific language that can elevate our results in that area. Okay. So patients are seeking information. They need to be informed about where they stand. And we all have barriers. Patients do have barriers that often get in the way. And it’s important if we really want to drive patients acceptance of periodontal services we need to do a better job at helping them overcome those barriers [silence] periodontal disease is an oral manifestation with systemic condition. We know that. So let’s do a quick science touch-up. Let’s do a quick review of the latest science and the studies that are showing us that periodontal disease and treatment of that is about more than saving teeth. It really is about saving lives. Let’s talk through some of the science. We know patients may be thinking, “Well, what’s the big deal?” Right? “It’s just a cleaning.” But we all know it’s so much more than that. And poor oral hygiene is just one of the risk factors that can contribute to the decline of the patient’s oral health. Right? We also have smoking, and we’ve already talked a little bit about age, how age can be a tremendous factor. One can say that periodontal disease is a natural part of the aging process. As we age, it’s not uncommon to see a decline in periodontal health. Okay, we know gender also plays a role in this scenario. So there’s a lot of risk factors happening when it comes to periodontal disease. And I think it’s important that we know the facts about where we are as a profession and as an industry, and that our patients also have clarity on the severity of these risk factors and what it can mean to their overall systemic health. So we don’t have time to do a huge dive and go over all the latest science, but I want to share with you a few studies that I found compelling. Because initially when we see bleeding gums, years ago we might have thought, “Well, gosh. This patient needs the flossing lecture.” or “They need OHI. We got to teach them the Bass toothbrushing technique. That toothbrush has got to be angled at that 45-degree angle so they get maximum impact.” And it’s not that those things aren’t true, but we also know now that bleeding gums can be a key early warning sign for more than 20 serious medical disorders. It’s not just about poor hygiene that’s driving that. It could be indicative of a serious systemic issue that the patient needs our help with. Okay? So bleeding gums, the first clinical warning sign for leukemia. This is really important. It’s important for patients to understand where we are, and more than ever before, we have the science. Right? That supports the link between periodontal disease and systemic health. So we now have the research and the knowledge needed to address underlying medical issues that can cause poor oral health. Okay? And one can cause the other, and sometimes we see that it’s this vicious cycle. Okay? So let’s dive into some very compelling studies. This video. This short video is produced by AAOSH, the American Academy of Oral Systemic Health. And in this video, Dr. Dan Sindelar talks about a study that was published by the American Medical Association. Okay, I’m not going to play the whole thing for you, but I’m going to play what I think is the most compelling, important part of this study that was recently published. [music] That’s pretty compelling, right? It appears that of the half of all heart attack incidents in the United States are triggered by oral pathogens. Wow. Okay, so here’s the highlights of that study there for you. It’s really fascinating. We’ve long known, or suspected a link, between heart disease and periodontal disease and now, we actually have DNA [plane?] technology used with research to identify, yes, the bacteria that are found in the blood clots of those who suffered a heart attack or a stroke actually did originate in the mouth. That’s what’s happening with these patients. And it’s more than heart disease that’s concerning. Interestingly enough, there’s a lot more links coming out in recent years about the bacteria that cause periodontal disease and cancer, a variety of different kinds of cancers. Here’s a study that was published in the Cell Host & Microbe journal in 2013, talking about how fusobacterium nucleatum promotes colorectal carcinogenesis. So what happens is, the fusobacteria have found a way to enter the bloodstream – we’ll talk more about that in a minute – and they will actually turn on cancer growth genes and stimulate negative immune responses. And when that occurs, the colorectal tumors are formed. So lead researcher on this study was Dr. Yiping Han from Case Western Reserve University and she basically said, as a summary, “We need to work effectively in reducing fusobacteria load in the colon and the mouth.” Interestingly enough, fusobacterium nucleatum was also the bacterium that was linked to the first-ever documented case of a stillborn baby, caused septic infection of the unborn child because the mother had an upper respiratory tract infection a few weeks prior and it was determined that this bacterium was what caused the death of the fetus. So fusobacterium nucleatum is a very common bacteria associated with periodontal disease, but it’s a bad bug. These are some serious bacteria that we’re dealing with, here. And it’s important that we understand how serious it can be. Now, there’s more and more studies coming out. This was published in August of 2017. Gum disease: An increased link to many cancers. Not just colon or rectal tumors, not just one specific cancer, but this study was a large perspective cohort study showed post-menopausal women, interestingly enough, with a history of periodontal disease, including those who had never smoked, are at significantly increased overall risk for cancer as well as site-specific cancers. Lung, breast, esophageal, gallbladder, and melanoma, even. Increased risk, if they have a history of periodontal disease. So that’s stunning to me that we’re learning so much more about what’s actually happening. And you can see, you can read the details of the study if you like, but the association between periodontal disease and site-specific cancers was observed in multiple different areas, okay. So fascinating stuff. Another study that was published is that gum disease may increase lung cancer risk. And this was a study that was published in the Journal of Periodontology in 2016, and they found that people with periodontal disease have a 1.24-fold increased risk of developing lung cancer. Interestingly enough, in this study, the data also suggested that women with periodontal disease are more likely than males to develop lung cancer. So post-menopausal women with a history of periodontal disease are at risk for part of a lot of really potentially serious health threats. It’s important that we pay attention to that. Okay, here’s another one that was published. A severe gum disease was linked to 24% high risk of cancer. This was published by Tufts University. And again, fascinating stuff about how critical it is that we address the periodontal disease concerns, okay. One of the most common things that we hear from patients is, “Oh, I don’t have the money for all that. I just want the regular cleaning. I just want the free cleaning.” And I find this study was fascinating to me because this one showed that treating gum disease means lower annual medical costs. Treating gum disease reduces hospital admissions, especially on people that have had a history of other health challenges. People with a history of diabetes, stroke, heart disease, and pregnancy. All experienced dramatically lower annual medical costs. Over $5,600 for people with a history of stroke. I mean, that’s significant. Same thing with hospital admissions. People that had a history of stroke, it reduced their hospital admissions by 21%, heart disease 28%, diabetes more than 39%. This is really compelling information that I think helps us feel value and create urgency for patients who have a periodontal need, okay. Just as we talked about before, creating urgency and building value helps patients accept all different kinds of care. Resorptive care but also periodontal care. And it’s important for us to understand that we have a responsibility in helping build value and create urgency for these services that our patients desperately need. And in some instances, even though it can be frustrating, to deal with the patient that says, “Oh, I don’t need all that. Just give me the regular cleaning. Just give me the free cleaning.” They don’t know what they don’t know, and we have a responsibility to help them see why we’re having these conversations. Okay. So we’ve got an interesting challenge here, and we know more about what’s happening with the disease, right? We know that chronic periodontal infections have been classified as a biofilm disease. And a free-floating or planktonic bacteria is very different than bacteria that have succeeded in forming a biofilm. When bacteria succeed in forming a biofilm in the human host, the infection often becomes untreatable, and that’s when it develops into a chronic state. So we see biofilm diseases causing problems in our population by way of chronic ear infections. We all probably have all known of a young one that got ear infection, after ear infection, after ear infection when they were little. And the first few infections, the antibiotics helped them work through it just fine. But after a time, the antibiotics aren’t helping anymore. That’s when we know the bacteria has succeeded in creating a biofilm, and it becomes a biofilm disease and it becomes a chronic state. So then more invasive treatment is required, okay? So we see this with cystic fibrosis and diabetics. Biofilm diseases are important for us to pay attention to because they affect millions of people every year. They cause many deaths. I believe the latest statistic I saw was 500,000 people a year actually die from biofilm infections. Okay. So this is important for us to keep in mind, because once inside the biofilm, the cells become more resistant to the body’s natural defense mechanism. They’re resistant to antibiotics, it’s actually a thousand times more resistant to antibiotics. And we’ve seen overuse of antibiotics and antimicrobials contributing to the development of super bacteria. So this is really interesting. As much research as we have proving significant health risks, health threats for patients that have periodontal disease we also have research showing us that gold standard antimicrobial products that many of us have used for decades, are no longer as effective as they once were. So this creates chaos in the marketplace in some instances because we have this science that’s showing us it’s time to think differently about these challenges. Okay. It’s time to think differently about where we are. And here is one of the most compelling things that we’ve learned in recent years. It’s that scaling and root planing alone is not enough. Scaling and root planing alone is not enough, especially if we’re dealing with biofilm infections. Did you know that bacteria levels return to pre-treatment levels 21 to 60 days after we’ve completed scaling and root planing? If all we’re doing is scaling and root planing, 21 to 60 days later, this is what we’ve got. If all we do is scaling and root planing, it’s like mowing an infested lawn and expecting things to improve. We can mow the lawn and it’s weed ridden, is it going to look better for a couple of days, maybe a couple of weeks? Yes, but unless we address the source of the infestation, where are we going to be 60 days from now? Right back where we started, right? So that’s why we’re seeing strategies evolving to focus on reducing the bacteria in the mouth and the rest of the body. We’ve got to look beyond our traditional methods, that for many of us, when I went to hygiene school that’s what we were taught. It was all scaling and root planing, okay? So we are seeing multi-faceted approach emerge. We’re seeing scaling and root planing plus additional adjunctive procedures. Scaling and planing plus laser treatments. Scaling and root planing plus laser treatments and locally delivered antibiotics. There’s a reason for that, right? Because when we have a patient that has periodontal infection, certainly we have the deposit, the calculus that needs to be removed, right? But we also need to address the bacterial infestation, which is where the lasers come in, and we need to treat the infection, which is where the arrestin comes in. Okay. So it’s not enough just to remove the calculus, we also need to reduce the bacteria load and treat the infection, which is why multi-faceted approach is so powerful. Okay, so as we go through this, one of the other challenges I find really compelling is that for many of us, we know how important it is that patients get this periodontal care beat. We talk with the patient, we identify, we tell them exactly what they need. But our challenge often comes in patient acceptance. We can talk about scaling and root planing all day long but we may not have everybody moving forward, okay? So we’re going to talk through five steps that can help us improve case acceptance of periodontal procedures. And I want to begin that conversation by really simplifying what we’re trying to accomplish. When it comes to patient conversion, we’re seeking a change of attitude, emotion, or viewpoint from one of indifference, disbelief, or antagonism to one of acceptance. So let’s stop and break that down for a minute. When we’re talking about periodontal disease, do we ever deal with patients who are indifferent? Yeah, we deal with that all the time don’t we? Because you can have a patient coming through the door, Class 4, mobility everywhere, and the fact that they sneeze just so, we’re worried. And what are they wanting? What do they ask us for? Whitening, every time, right? They want their teeth whitened. They’re completely indifferent to the fact that their disease is advanced because they don’t know what they don’t know, right? Do we ever have patients that don’t believe us, that are in disbelief that they need to have anything done? Sure, we do. Because I don’t know about you, we see a fair number of patients that come through our doors for a second opinion, because someone’s told them something and they don’t believe it. That trust bucket is not full, so they’re seeking an outside opinion. Do we ever have patients that are antagonistic about the care they need? Yes, we do. An intuitive [inaudible] can spot those ones coming from a mile away because they call the office and say, “I need to schedule an appointment for a regular cleaning.” Right? Which reason might suggest that they are adamant about a regular cleaning because they’ve been told someplace else that they need more than that. Okay? So we deal with these situations all the time when it comes to discussing periodontal therapy. What we want to dive into is how we can move the patient and inspire a change of attitude, emotion or viewpoint more consistently. Okay? How can we overcome some of these challenges on a more consistent basis, and help patients understand why they need the care that they need so that we can help minimize future problems for them. Okay. That’s what we’re going to be talking about here as we go. And we know that there’s conflict created when we don’t have alignment here, which is why it’s so powerful to have the hygienist and the dentist together working on this partnership. This was something that was written on the whiteboard in the south lounge. It says, “A patient doesn’t want quads. Fine. Write in the chart, explain, then give them their free cleaning. Better than a hygienist doing nothing and the patient not coming back.” Can you kind of feel the frustration in this sentence? So can you tell this has been a point of conflict with this team? So the key here is we’ve got to be aligned. We’ve got to be on the same page. But we also should know what steps the other is using to shift the patient, their emotion or viewpoint, to one of acceptance. Okay?